Food premiums have been around forever. Many of us can remember sitting at the breakfast table while eating our cereal and reading the back of the box to see what you had to do in order to obtain one of those toys. I can remember doing this when I was little with those tiny Monster In My Pocket figures. Almost every kid will do this at some time in their life. Babe Ruth is considered to be the greatest baseball player to ever live. He was larger than life, and was adored by everyone. It shouldn’t be a surprise that he teamed-up with various companies to endorse certain products. In the mid 1930’s, Quaker Oats made a few different Babe Ruth pins that you had to send away for. One of them was this small metal pin. 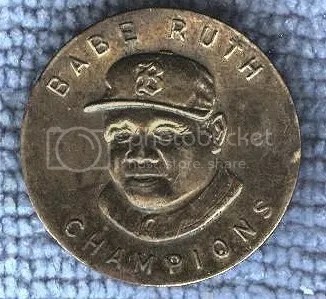 Of all the Babe Ruth Quaker Oats pins, I find this one to be the most creepy. Depending on the pin’s condition, Ruth’s pupils may or may not always be there. This can make the Bambino look like a zombie. Being a food premium, its not made of with the highest quality metal. Quaker Oats caught Ruth near the end of his career as he is pictured wearing a Boston Braves hat. They usually sell for about $65.00. 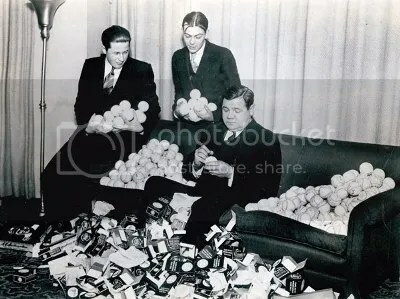 This is probably one of the most seen images of Babe Ruth, but its my favorite. Only if we had a time machine.